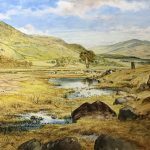 Paton was a Scottish landscape artist working in the second half of the 19th century. He trained under the mid-19th century artist, John Houston (1802–1884) RSA. He was elected an associate of the Royal Scottish Academy (ARSA) in 1857 and became a full member (RSA) in 1865. In 1878 he became a member of the Royal Society of Watercolourists (RSW).